Formal specification of various constraints, including quality of service (QoS) and price, is very important for successful dynamic (i.e., runtime) composition of Web Services. For specification of these constraints, it is important to formally define QoS metrics, measurement units, and currency units used. Ontologies provide a mechanism for such formal definition. 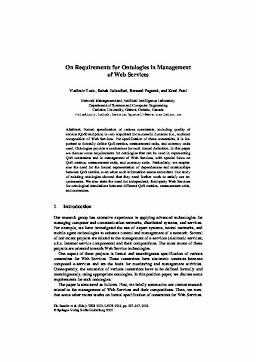 In this paper we discuss some requirements for ontologies that can be used in representing QoS constraints and in management of Web Services, with special focus on QoS metrics, measurement units, and currency units. Particularly, we emphasize the need for the formal representation of dependencies and relationships between QoS metrics, even when such information seems redundant. Our study of existing ontologies showed that they need further work to satisfy our requirements. We also state the need for independent, third-party Web Services for ontological translations between different QoS metrics, measurement units, and currencies.